Identification: Whirling disease is caused from an infestation of Myxobolus cerebralis within fish in the family Salmonidae. Myxobolus cerebralis is a parasitic organism with a complex life cycle requiring two hosts, Tubifex tubifex and the Salmonidae family of fish. The ingestion of the myxospore by T. tubifex begins this the life cycle. Once in contact with the epithelial cell in the lining of the gut, the myxospore projects its polar filaments into the cell. An amoeba-like sporoplast then penetrates the hosts cell, and begins to multiply rapidly. The host cell eventually bursts, releasing triactinomyxon (TAM) spores into the water. Once in the water, the sporoplasm from the triactinomyxon penetrates the epidermal or gill epithelial cells in the fish and begins to replicate itself. These epidermal or gill epithelial cells rupture and release many replicated cells into the host cell cytoplasm, only to repeat the cycle again deeper into the dermis and subcutis layers. The infection eventually makes its way to the spinal cord and brain and causes pressure on the nerves which control the pigment cells in the tail resulting in a black tail. The parasite also migrates to cartilage in the Skelton through the nervous system. The parasite integrates itself into the host's cartilage causing deformities in the skeletal structure, and increased pressure on the brain tissue. This causes the fish to whirl uncontrollably, and prevents it from effectively evading predators. Image showing infected areas of tail, spine and brain. Original Distribution: Myxobolus cerebralis is native to the Eurasian continent. The first confirmed outbreak of whirling disease occurred in Germany in a non-indigenous species of rainbow trout, Salmon gairdneri (Hofer, 1903). From 1903 until 1952 whirling disease had been reported from Germany, France, and Denmark (Bruhl, 1926; Schaperclaus, 1931; Luling, 1952; Vanco, 1992). Current Distribution: Whirling disease is found throughout several European countries, in South Africa, and in New Zealand. 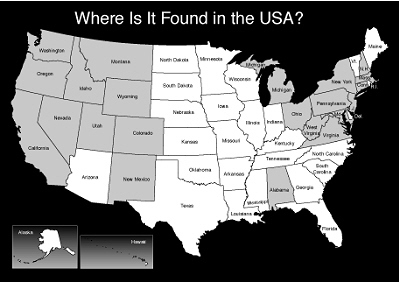 In the United States it has been found in 23 of the 50 states with Colorado and Montana be the most heavily affected. Fourteen of the fifteen major drainages in Colorado contain Myxobolus cerebralis, the parasite that causes whirling disease. Five hundred miles of five major trout streams (Cache La Poudre, Colorado, Gunnison, South Platte and Rio Grande rivers) are showing partial to complete loss of wild rainbow trout recruitment over the past five years. Mode(s) of Introduction: Myxobolus cerebralis can be introduced to new regions by the natural flow of water in the stream, movement of infected fish and through the digestive tracts of birds and other fish who consume an infected fish and then spread the myxospore through their feces. Reason(s) Why it has Become Established: In additon to the natural modes listed above, whirling disease has benefited from the spread of the parasite into fish hatcheries and the subsequent release of these fish stocks into waterways for commercial and sport fishing. Ecological Role: Myxobolus cerebralis is a parasite that utilizes two hosts species, the Tubifex tubifex and the Salmonidae family of fish. Myxobolus cerebralis provides no benefit to its hosts and is fact damaging to both species. Benefit(s): There are no beneficial effects to humans or fish populations resulting from Myxobolus cerebralis. Threat(s): Whirling disease has devastated of wild trout populations on some of the West's most popular streams and the reduced availability of stocking hatchery-reared trout. Whirling disease impact on both wild and hatchery reared trout. Fourteen of the fifteen major drainages in Colorado contain Myxobolus cerebralis. Over five hundred miles of five major trout streams (Cache La Poudre, Colorado, Gunnison, South Platte and Rio Grande rivers) are showing partial to complete loss of wild rainbow trout recruitment over the past five years. Control Level Diagnosis: Control of Myxobolus cerebralis should be classified as a "Medium Level". Myxobolus cerebralis has had a significant negative impact of Trout and Salmon populations and consequently on sport fishing activities. However, the disease is not likely drastically impact all Salmonidae fish in any one particular region the near future. Control Method: Research on the control of Myxobolus cerebralis indicates that while eradication of the species is unlikely, there is hope that its spread can be controlled through a series of management practices and regulation. Water-filtering devices using ultraviolet light can be used in hatcheries to kill the Myxobolus cerebralis parasite in help control its spread. The spores often reside in geographically localized "hotspots" within rivers often no greater that 20 to 30 square meters in size. Identifying and treating these areas may significantly reduce occurrence of the disease and increase the survival rate for nearby spawning trout. Do not transport any fish from one body of water to another. Do not dispose of fish entrails or other by-products that may hold spores into any body of water or into sinks. Drain boats, equipment, coolers, live bait wells and any holder of water which can hold the parasite. Thoroughly wash mud from vehicles, boats, trailers, waders, boots, fishing equipment and anything that comes in contact with spores or worms found in the stream bed mud.